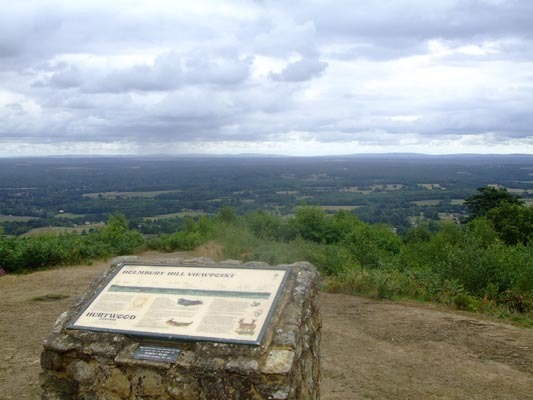 Holmbury Hill is the middle 'peak' in the range of 3 hills affectionately known as Surrey's 'little switzerland'. To one side is Leath Hill whilst on other is Peak Hill. 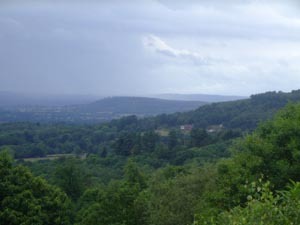 The hilltop was the site of a iron-age fort and offers fine views of South Surrey and Sussex. The Hill is part of Hurt Wood, which is very popular with mountain bikers so keep an ear out for the clanging of bike chains. The walk starts from Gomshall BR Station, which is serviced from Dorking or Guildford by First Great Western trains but runs only every 2 Hours. 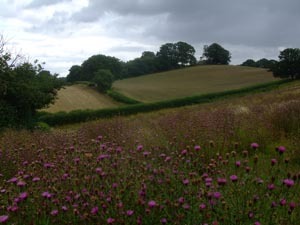 I headed toward Abinger Common on easy going footpaths through farmland. 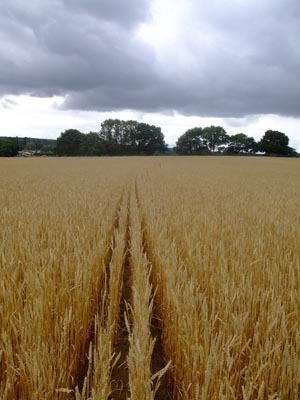 The land here is undulating and with the backdrop of the North Downs provides great views. 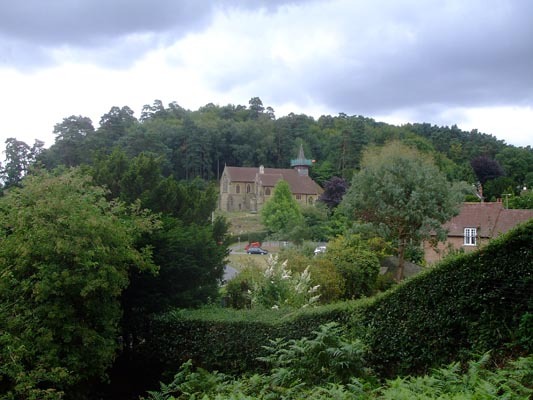 At Abinger Common you pass through a church yard and turn southward entering woodland at Pasture Wood untill getting to the small village Holmbury St Mary which has its church set in the hill. Here you enter Hurt Wood joining the Greensand Way and starting slow climb to viewpoint. At hilltop sat and had lunch on seat with inscription: 'To all free spirits in memory of Felix Laffan and Dave Birks, Matterhorn Northface, July 1987, Aged 24 years' Had a look online but couldn't find any more info on this. I had planned to walk on to Pitch Hill but got a bit lost around Coverwood and found myself heading north to Peaslake so decided to head back to Gomshall. Walk here was sometimes on roadway but mostly lanes with little traffic. Felix Laffan was a schoolfriend of mine at Glebelands School in Cranleigh. His father, Mike Laffan, taught history there, if I remember rightly, at the time. Felix was a keen rock-climber and joined Guildford Mountaineering Club in his late teens. My mother's ex-partner was a member at the time and used to climb with Felix on occasion. After attending Godalming College, Felix had gone on to study naval architecture at one of the universities on the south coast (Southampton, Plymouth, somewhere like that). I remember that he'd gone climbing somewhere and had never returned but it wasn't until I found your post today that I found it had been a climb up the Matterhorn that had cost him his life. Just been reading that the Church at Holmbury St. Mary was designed and built by G.E. Street in 1873, he also designed the London Law Courts and is buried in Westminster Abbey. I saw your post when I did a search for information about Felix! He was my best friend at Glebelands and I have many great memories of him. Like most kids we fell out over something or other but I tried to keep in touch after we left school. His father was Rolf Laffan, not the history teacher, who had a similar name. I know Felix had a passion for mountain climbing and boat design! Sadly, whilst climbing the Matterhorn, he ran into some extreme weather. Some in his party were seen falling to their deaths, but Felix and his friend were spotted trying to climb out of trouble. That was the last time that they were seen, and to my knowledge he and his friend have never been found! It was all very tragic, and even made national TV. I'm now a commercial pilot and every time I'm flying over the Alps my thoughts are with him! They set off for their climb with Dave wearing my Clark's cream boots. I have often thought of them (the boots included as well) just as I am right now. Ah to be so young and so wrongly infallible. I'd love to get in touch. I now live in Cheltenham. Ps I am really one Bel Vaz, a reformed yuppie today.